Los Angeles (TADIAS) – Summer is officially here, and while everybody loves the sunshine, some of us are coming to terms with the fact that our New Years Resolutions never made it past January. This can bring on a sense of alarm as the layers of clothing come off, and may lead us to desperate measures (i.e.- drinking lemonade with berbere for 10 days). While these quick fixes are tempting, and may help us squeeze into an outfit for a special event, they aren’t sustainable. Rather than beat ourselves up for not sticking with our New Years resolutions, we can look at summer as a time to recommit to our health and fitness plan. With the warmer temperature, we naturally crave lighter foods, making this a great time to transition to a diet with more fresh foods. In my own life, adding small manageable practices into my daily routine has been very fruitful (pun intended)! One of my favorite additions to my diet this year has been green smoothies, which I drink almost daily. While green smoothies may look a little like a failed attempt at gomen, they are delicious and have numerous health benefits. 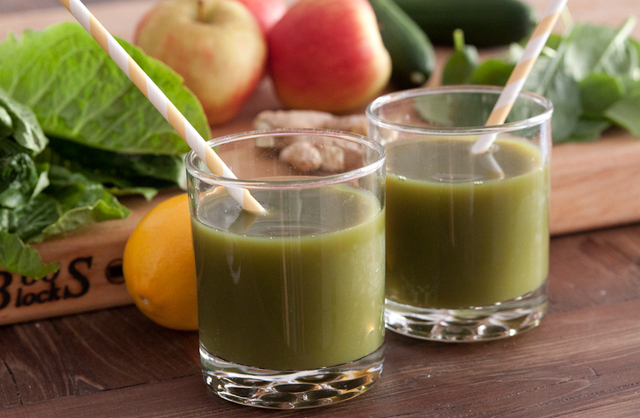 They are simply a liquid base blended with fruit and leafy greens. When consumed first thing in the morning, green smoothies give you a natural energy boost, and will help you get that summer glow in no time. *Chlorophyll aids in detoxification/blood purification. When I started experimenting with green smoothies, I simply added spinach or kale to my fruit smoothies. Over time, I’ve gotten much more creative, and tapped into recipes from Green Smoothie advocates such as Kimberly Snyder and Victoria Boutenko. I love the recipe below and make it every morning before work, modifying it based on what’s available at my local farmers market. I’ve shared it with my loved ones, and my co-workers and family members are all hooked. In fact, my 2 year-old nephew whips out his cup as soon as he sees me pull out leafy greens, and my office manager recently purchased a Vitamix blender for the office. A lot of these ingredients are probably already in your fridge (think salata minus the karya). Drink regularly and everyone will think you’ve just returned from vacation in Awassa or Bahir Dar! I am a green smoothie convert thanks to Nesanet (along with my 2 year old son)! Gomen for breakfast sounds scary, but it is actually delicious and does wonders for curbing all of the not-so-good for you cravings! Nesanet, thank you! First, I must state here and now that there are MANY reasons to start green juicing, but I am going to list the reasons I have personally experienced: Able to consume a wide variety of produce, Assimilate nutrients faster, Promotes alkalinity – shifts body from acidic to alkaline, Youthful appearance, smoother skin, Encourages weight loss/control, Allows for efficient elimination, Improves energy level, etc, etc. Hi Does any one know that teff is also used as an alternative health choice to wheat? Would love to explore that as well! Glad to hear you are seeing results Nunu and Keru! Heran-I highly recommend 100% teff injera-it tastes wonderful and is very easy to digest. I also make teff pancakes and cookies and they are delicious (I will share recipes in the near future). You can purchase teff at most Ethiopian markets, and Bob’s Red Mill Teff Flour is available in most health food stores.